I don’t know anyone who’s read about or watched investigations of the JonBenét Ramsey murder who isn’t still obsessed with the unsolved case. The last time we caught up on the story, Dr. Phil did an interview with JonBenet’s now adult brother, Burke, and let’s just say it only made the waters murkier. Netflix’s take is altogether different, though from this trailer, it’ll be just as compelling as the many other slants. There’s a very David Lynchian feel to Kitty Green’s (Ukraine Is Not a Brothel) documentary, which features Boulder area actors (professional and non) auditioning to play Patsy, John, Burke and JonBenét Ramsey, while talking about their own feelings, suspicions and theories about who might have killed the six-year old girl. 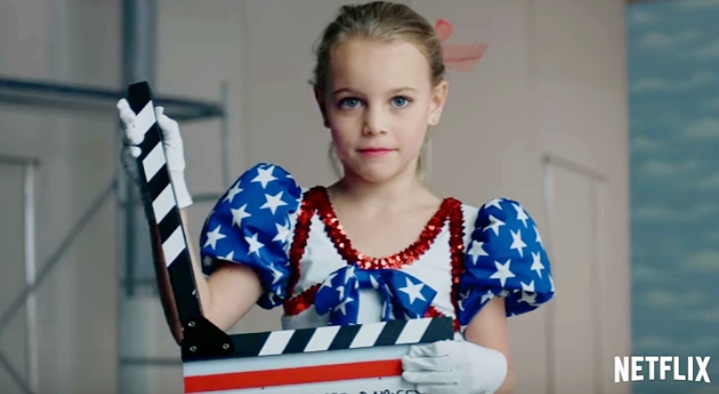 The first look is bizarre, haunting — it’s very disconcerting to see the young girls dressed like and discussing JonBenét — and I’m pretty sure everyone who’s ever been morbidly curious about the case will watch the heck out of it. I know I will. Speaking of Lynch, I would so love to see his version of events. Casting JonBenet premieres on Netflix April 28th. Tags: Aeona CruzAmy DowdAspen RaderBurke RamseyBurke Ramsey 911 callCarolyn StraussCasting JonBenetDanika ToolsonDavid LynchDeb HultgrenDorinda DercarDr. Henry LeeDr. Phil Burke RamseyEd HickokElle WalkerEmma WinslowFBIGary J. NeugerHack HylandHannah CagwinHenry LeeJ. Michael SterlingJerry CorteseJohn RamseyJonBenet RamseyKit ThompsonKitty GreenLiv BagleyNetflixNicole HamiltonPatsy RamseyRhonda BelserStephanie FedericoTamara HutchinsTeresa CocasThe Case of: JonBenét RamseyWho Killed JonBenet Ramsey?